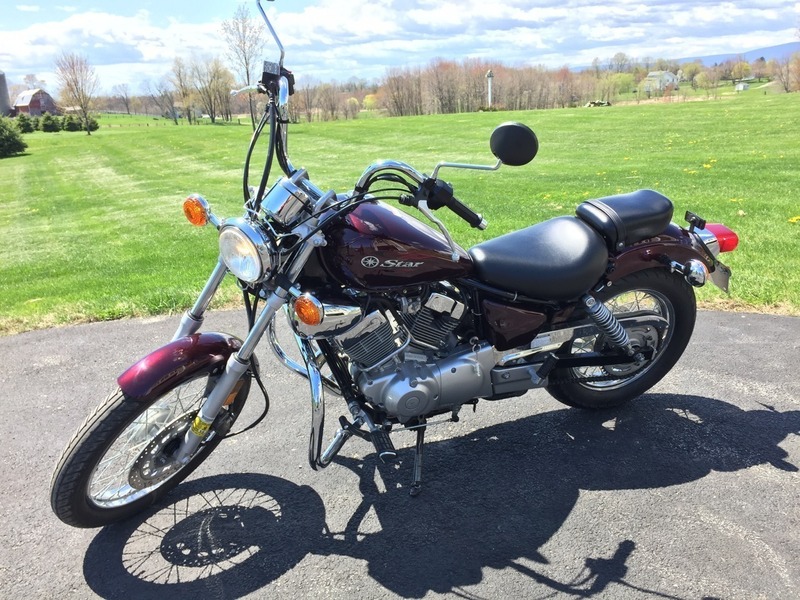 Overview: The Yamaha 2009 V Star 250 is in excellent condition with only 1,023 miles on it. She rides well and the seat is very comfortable. 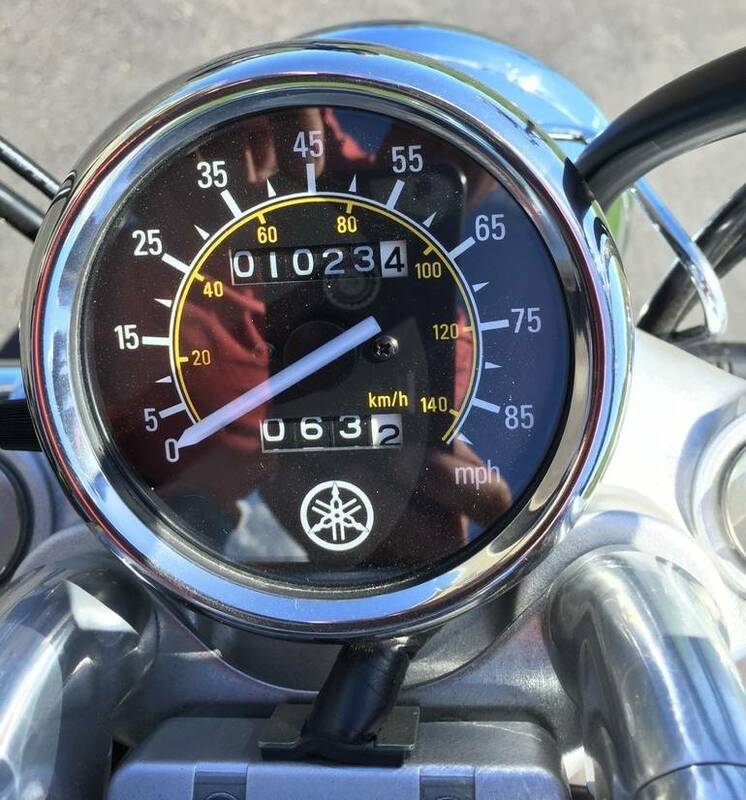 Purchase price includes the bike with everything you see in the attached pictures, Manufacturers Owners Manual and the toolkit (which is stored inside the toolkit compartment). Bike is equipped with forward controls, modified ape handle bars, extended mirrors and a chrome engine guard. Color is Black Cherry. I purchased the bike so I could go out for occasional country rides and ended up having so much fun on it I graduated to a larger bike quicker than expected. It has never been dropped or driven in the rain. The bike has no dings or scratches. Bike was completely serviced in Nov 2014 and had a new battery installed, before being stored indoors for the winter. Bike has been ridden several times this Spring. Key Features: Light weight and a seat just 27 inches from the pavement make the V Star 250 a great trainer or good all-around bike. Dual exhausts, plenty of quality chrome and typical Star attention to detail; this is one sharp little cruiser. Front disc brake provides highly controllable stopping power. Engine: 249 cc air-cooled, 60-degree V-twin engine with a long, 66 mm stroke produces plenty of bottom-end torque and smooth roll-on power. Single 26 mm Mikuni downdraft carburetor ensures optimal fuel/air mixing and delivery with superb throttle response. Widely geared five-speed transmission makes the most of V Star 250s power-band. Easy, dependable electric starting. 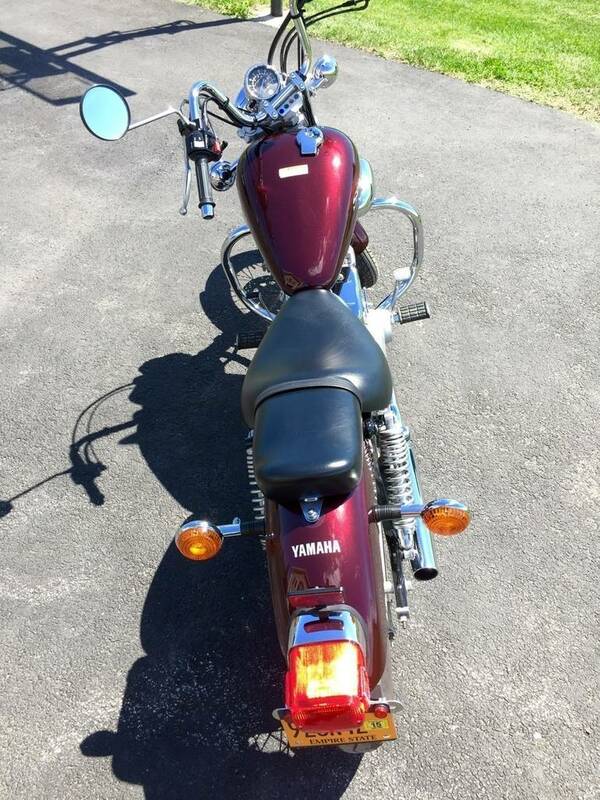 Beautiful dual chrome exhaust pipes let the engine breathe and put out that classic V-twin rumble. Automatic cam chain tensioner virtually eliminates maintenance and helps extend engine life. Chassis/Suspension: 58.7-inch wheelbase creates a long, low package with great handling and maneuverability. 282 mm single front disc brake and a rear drum brake provide plenty of stopping power. Plush and low-stepped saddle keeps the center of gravity low and lets almost everybody flatfoot the pavement. Telescopic front fork with 5.5 inches of travel provides a nice, smooth ride. Twin rear shocks feature 3.9 inches of travel and adjustable spring preload for versatility under various loads. Additional Features: Extensive chrome details accent engine and side covers for incomparable big bike fit and finish. Stylishly sculpted teardrop fuel tank features 2.5-gallon capacity for excellent cruising range. Chrome pullback handlebars are easy to reach and great looking. Forward-set foot-pegs enhance rider comfort by creating added legroom. Wide rear fender and front and rear wire-spoked wheels add the perfect classic, retro touch to this stylish package. Wheels: Laced Dimensions: Length: 86.2 in. Height: 44.9 in. Width: 32.1 in. Weight: 324 lbs. Wheelbase:58.7 in. 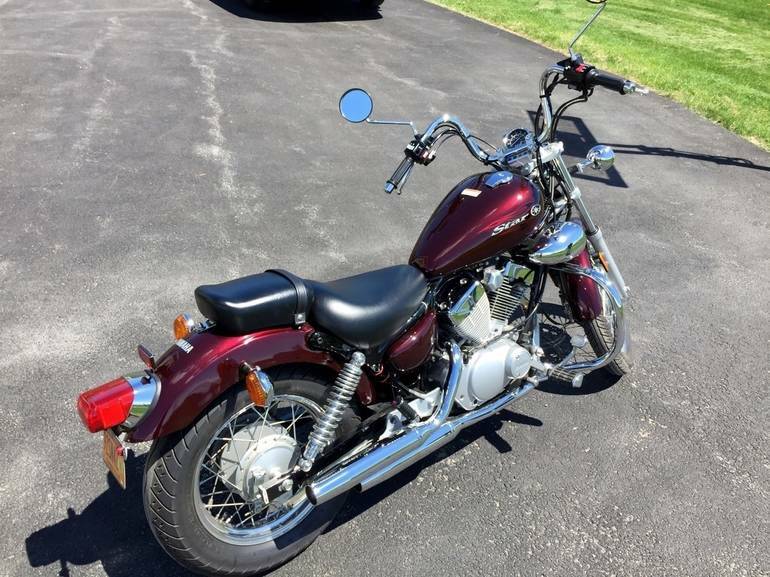 All Yamaha pictures are kind of Yamaha HD motorcycles picture was taken, including motor fuel gauge, engine, engine mounts, tires, fuel tank, the car handles, lights and so on, 2009 Yamaha 250 full-screen viewing,2009 Yamaha Motorcycles today Price: $2,555 .